As the practice of e-learning continues to proliferate, online educators, especially in the computing disciplines, are facing special challenges, due to the lack of relevant literature, the technical nature of the courses, and the perceived need for direct student support mechanisms. This paper presents a constructivist instructional approach to the online delivery of a highly technical Web development course that has been traditionally taught in face-to-face settings and illustrates it in the form of a case study. The results of the evaluation, based on three different data sources, indicate that the constructivist instructional strategies have played a significant role in the high levels of student satisfaction and the success of the course. When implemented online, the strategies can be as effective as when conducted face-to-face. The paper makes a unique contribution to the e-learning research by providing empirical evidence and indicative support for the successful application of problem-based learning methods in a fully online environment and exemplifying the use of screencasts as an effective instructional technology. It is hoped that some or all of the practical techniques illustrated in this case study will prove beneficial to online educators facing similar challenges in other technical fields. Wang, Y.D. (2014). Applying Constructivist Instructional Strategies to E-Learning: A Case Study of a Web Development Course. International Journal on E-Learning, 13 (3), 375-406. Waynesville, NC USA: Association for the Advancement of Computing in Education (AACE). Retrieved April 22, 2019 from https://www.learntechlib.org/primary/p/40420/. Anderson, T. (2003). Getting the mix right again: An updated and theoretical rationale for interaction. International Review of Research in Open and Distance Learning, 4(2), 9-14. Anderson, T., & Dron, J. (2011). Three generations of distance education pedagogy. The International Review of Research in Open and Distance Learning, 12(3), 80-97. Arbaugh, J.B., & Benbunan-Fich, R. (2006). An investigation of epistemological and social dimensions of teaching online learning environments. Academy of Management Learning& Education, 5, 435-447. Audi, R. (2002). Epistemology: A Contemporary Introduction to the Theory of Knowledge. New York, NY: Routledge. Ausburn, L.J. (2004). Course design elements most valued by adult learners in blended online education environments: An American perspective. Educational Meida International, 41, 327-337. Bates, T. (2004). The promise and myths of e-learning in post-secondary education. In M. Castells (Ed. ), The Network Society: ACross-cultural Perspective, pp. 271-292. Bernard, R.M., Abrami, P.C., Borokhovski, E., Wade, C.A., Tamim, R.M., Surkes, M.A., & Bethel, E.C. (2009). A meta-analysis of three types of interaction treatments in distance education. Review of Educational Research, 79(3), 1243-1289. Brown, J. (2006). Teaching web applications development in a fully online environment: challenges, approaches and implementation. 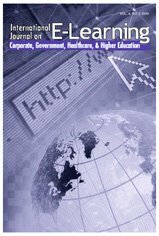 In Proceedings of The 2006 International Conference on e-Learning, e-Business, Enterprise Information Systems, EGovernment, & Outsourcing (pp. 162-172), Las Vegas, NV, USA. Brown, A., Luterbach, K., & Sugar, W. (2009). The current state of screencast technology and what is known about its instructional effectiveness. In Proceedings of Society for Information Technology& Teacher Education International Conference 2009 (pp. 1748-1753), Charleston, SC, USA. Buckley, W., & Smith, A. (2008). Application of multimedia technologies to enhance distance learning. Rehabilitation Education for Blindness and Visual Impairment, 39(2), 57-65. Can, T. (2009). Learning and teaching languages online: A constructivist approach. Novitas-ROYAL, 3(1), 60-74. Chitanana, L. (2012). A constructivist approach to the design and delivery of an online professional development course: A case of the iEARN online course. International Journal of Instruciton, 5(1), 23-48. Dell, C.A., Low, C., & Wilker, J.F. (2010). Comparing student achievement in online and face-to-face class formats. Journal of Online Learning and Teaching, 6(1), 30-42. Dewey, J. (1996). Democracy and Education: An Introduction to the Philosophy of Education. New York, NY: The Free Press. Dillon, P., & Ahlberg, M. (2006). Integrativism as a theoretical and organisational framework for e-learning and practitioner research. Technology, Pedagogy and Education, 15(1), 7-30. Dobozy, E. (2008). The use and usefulness of non-assessed online learning: Tracking students’ behavior on LAMS. In Proceedings of The 3rd International LAMS & Learning Design Conference (pp. 59-69), Sydney, Australia. Ellis, H.J.C. (2006). An evaluation of learning in an online project-based Web application design and development course. Journal of Computing Sciences in Colleges, 21(6), 217-227. Ertmer, P., & Newby, T. (1993). Behaviorism, cognitivism, constructivism: Comparing critical features from an instructional design perspective. Performance Improvement Quarterly, 6(4), 50-72. Fields, R.D. (2005). Making memories stick. Scientific American, 292(2), 75-81. Gaytan, J. & McEwen, B.C. (2007). Effective online instructional and assessment strategies. The American Journal of Distance Education, 21(3), 117-132. Hmelo-Silver, C.E. (2004). Problem-based learning: What and how do students learn. Educational Psychology Review, 6(3), 235-266. Hoic-Bozic, N. (2009). A blended learning approach to course design and implementation. IEEE Transactions on Education, 52(1), 19-30. Holden, J.T., & Westfall, P.J.L. (2006). An Instructional Media Selection Guide for Distance Learning. USDLA, Boston. Honebein, P.C., Duffy, T.M, & Fishman, B.J. (1993). Constructivism and the design of learning environments: context and authentic activities for learning. In T.M. Duffy, J. Lowyck, & D.H. Jonassen (Ed. ), Designing Environments for Constructive Learning (pp. 87-108), Heidelberg, Germany: Springer-Verlag Berlin. Jonassen, D.H. (1999). Designing constructivist learning environments. In C. Reigeluth (Ed. ), Instructional Design Theories and Models: A New Paradigm of Instructional Theory, Vol. 2, pp. 215-239, Mawah, NJ: Lawrence Erlbaum Associates. Koohang, A., Riley, L., & Smith, T. (2009). E-learning and constructivism: From theory to application. Interdisciplinary Journal of E-learning and Learning Objects, 5, 91-108. Kop, R., & Hill, A. (2008). Connectivism: Learning theory of the future or vestige of the past? The International Review of Research in Open and Distance Learning, 9(3), 69-81. Kruger, J. (2010). Screencasts: Augmenting learning materials in open distance learning. In Proceedings of IADIS International Conference Internet Technologies and Society 2010 (pp. 272-276), Perth, Australia. Miller, G. (2003). The cognitive revolution: A historical perspective. Trends in Cognitive Sciences, 7(3), 141-144. Moore, M.G. 1989. Three types of interaction. American Journal of Distance Education, 3(2), 1-6. Murphy, K.L., Mahoney, S.E., Chen, C.Y., Mendoza-Diaz, N.V., & Yang, X. (2005). A constructivist model of mentoring, coaching, and facilitating online discussion. Distance Education, 26(3), 341-366. NIU. (2010). Screencasts as a pedagogical tool. TA Connections. Retrieved June 2, 2011, from http://law.niu.edu/taconnections/2010/spring/screencasts.shtml Nuy, H., & Moust, J. (1990). Students and problem-based learning: How well do they fit in? Journal of Professional Legal Education, 8(2), 97-114. O’Regan, K. (2003). Emotion and e-learning. Journal of Asynchronous Learning Networks, 7(3), 78-92. Otting, H., & Zwaal, R. (2006). Critical task characteristics in problem-based learning. Industry and Higher Education, 20(5), 347-357. Peng, W. (2010). Practice and experience in the application of problem-based learning in computer programming course. In Proceedings of 2010 International Conference on Educational and Information Technology (pp. V1-170-V1-172), Chongqing, China. Peters, L. Shmerling, S., & Karren, R. (2011). Constructivist pedagogy in asynchronous online education: Examining proactive behavior and the impact on student engagement levels. International Journal on E-Learning, 10(3), 311-330. Pimentel, J. (1999). Design of net-learning systems based on experiential learning. Journal of Asynchronous Learning Networks, 3(2), 64-90. Ruey, S. (2010). A case study of constructivist instructional strategies for adult online learning. British Journal of Educational Technology, 41(5), 706-720. Savery, J.R., & Duffy, T.M. (2001). Problem based learning: An instructional model and its constructivist framework. CRLT Technical Report (No. 16-01). Center for Research on Learning and Technology, Bloomington, USA. Siemens, G. (2007). Connectivism: Creating a learning ecology in distributed environments. In T. Hug (Ed. ), Didactics of Microlearning: Concepts, Discourse and Examples., pp. 53-68. Munster, Germany: Waxmann Verlag. Simonson, M., Schlosser, C., & Orellana, A. (2011) Distance education research: A review of the literature. Journal of Computing in Higher Education, 23, 124-142. Sims, R. (2008). Rethinking (e)learning: A manifesto for connected generations. Distance Education, 29(2), 153-164. Solomonidou, C. (2009). Constructivist design and evaluation of interactive educational software: A research-based approach and examples. The Journal for Open and Distance Education and Educational Technology, 5(1). Retrieved February 25, 2012, from http://www.openedu.gr/share/magaz_files/papers_pdf/01.pdf St. Clair, D.J. (2009). My experience with teaching online: Confessions and observations of a survivor. Journal of Online Learning and Teaching, 5(1), 166-175. Taplin, M. (2000). Problem-based learning in distance education: Practitioners’ beliefs about an action learning project. Distance Education, 21(2), 278-299. Wang, Y.D., & Zahadat, N. (2009). Teaching Web development in the Web 2.0 era. In Proceedings of SIGITE’09 (pp. 80-86), Fairfax, VA, USA. Wiensenberg, F., & Stacey, E. (2005). Reflections on teaching and learning online: Quality program design, delivery and support issues from across-global perspective. Distance Education, 26(3), 385-404.